Volunteers across Dorset are gearing up to pedal for their parish at this year’s Ride & Stride event. The annual fundraising day, organised by Dorset Historic Churches Trust, invites participants to cycle, walk and even horse ride, to as many churches as possible on Saturday 14 September between 10am-6pm. Riders and Striders taking part in the event will be raising money for the repair of Dorset’s historic churches, with all sponsorship split between their nominated church and the Dorset Historic Churches Trust (DHCT). Dorset is filled with spectacular church heritage and the event presents an opportunity to explore the history and architecture of churches, even those that are not regularly open such as the privately owned, St Mary, Tarrant Rawston near Blandford, the chapel in the grounds of Wolfeton House and the tiny pre-Reformation Corton chapel near Portesham. Over 200 churches across towns and villages will be open throughout the day to provide refreshments and a well earned rest for all of the hard working riders and striders taking part in the event, alongside the opportunity to re explore the history and heritage of these churches. Last year’s event raised a record £60,923 in sponsorship, with 169 parish communities taking part in the fundraising event. Chairman of Dorset Historic Churches Trust, Simon Pomeroy said: “The annual Ride & Stride event is a great way for all the family to explore some of our wonderful local churches either on foot, by bicycle, wheelchair or on horseback, whilst at the same time raising funds to support your local church and the important work that DHCT does across the county. Regional and UK Top 200 law firm Porter Dodson, with offices in Sherborne and Dorchester and 3 in Somerset, is the sponsor of this year’s official Ride & Stride t-shirts, which will be given out to cyclists taking part in the event. 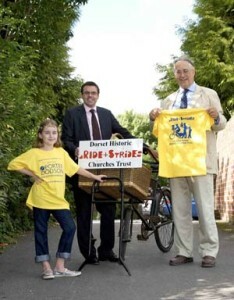 Since 1991, Dorset Historic Churches Trust has raised over £800,000 from the Ride & Stride event, formerly known as the Great Cycle Ride. The money raised from the annual Ride & Stride event is the main source of income for Dorset Historic Churches Trust, which last year helped 35 churches in need of repair and renovation, by awarding grants totalling £74,000. For more information about the Ride & Stride, please contact Anna Butler (Ride and Stride Coordinator) Tel. 01305 260004 or email: anna-butler@hotmail.co.uk or visit the DHCT website. Established by Sir Owen Morshead in 1960, the Dorset Historic Churches Trust is a voluntary run charity that raises funds and provides around £100,000 each year to Dorset’s churches and chapels of all Christian Denominations to assist the increasing costs of maintenance, restoration and improving facilities. Its main source of income is the annual ‘Ride & Stride’ that every September involves some 200 parish and church communities across the County.